In the project Archive for the Future bkkc examines the issues surrounding the preservation and management of archives and works of contemporary artists, specifically in relation to their legacy. 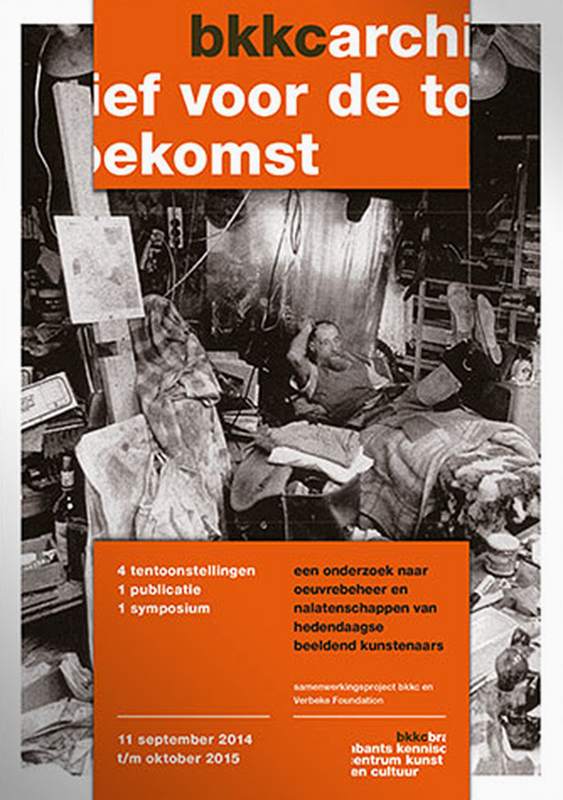 After four exhibitions and a study, which was a collaboration with the Verbeke Foundation, various artists, heirs of artists and institutions in the Netherlands and Flanders, the knowledge gained will be shared at this symposium in Museum De Pont. Speakers include Hendrik Driessen (director of Museum De Pont, Tilburg), Bart De Baere (director M HKA, Antwerp), Helene Vandenberghe (art historian, on behalf of the Estate Philippe Vandenberg, Brussels) and Stella Lohaus (on behalf of Bernd Lohaus Foundation, Antwerp). Chairman is Rick Vercauteren (director Museum van Bommel van Dam, Venlo). PARK is co-host: the participants in the symposium visit PARK and eat lunch there.